Our program is supported by state-of-the-art instruments and facilities. The instruments are maintained and supervised by technical personnel as departmental facilities. Most of our instrumentation is co-sponsored by the USC Core Instrumentation Fund, and comprises the USC Center of Excellence for Molecular Characterization. These labs are broadly accessible to all USC users and guests. Our facilities are listed below. Bruker EMX System: Continuous-wave EPR spectrometer operated at X-band (~ 9.5 GHz). This instrument is equipped with a liquid nitrogen temperature control setup, together with a TE10 cavity and a High-Sensitivity cavity. Bruker E580 FT/CW System: A pulsed EPR platform operated at X-band, capable of multiple-resonance measurements such as pulse-ELDOR (Electron-Electron Double Resonance) measuring nanometer distance between electron spin centers, and pulse-ENDOR (Electron Nuclear Double Resonance) for measuring hyperfine interactions between electron and nuclear spins. The Department operates an X-ray diffraction facility in the Ahmanson center (ACB 100) that is equipped with both single crystal and powder diffraction instruments. 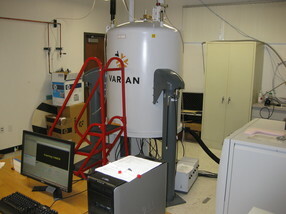 The Department has broadly capable instrumentation for mass spectrometry and elemental composition detection located in labs in the SGM building. 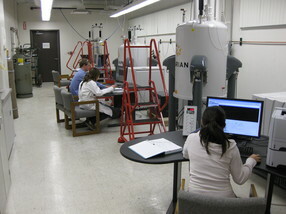 The Department operates a broadly capable lab for optical spectroscopy in OCW 109. The Department has a Dynacool 14T PPMS instrument adjacent to the Brent Melot lab in SGM 215. This instrument is equipped with several accessories. 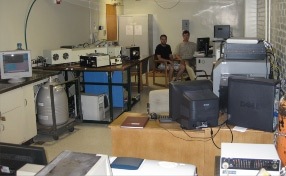 Many similar instruments, along with a wide variety of specialized laser spectroscopy equipment, surface analysis instruments, mass-selective gas chromatography, mass-selective HPLC, and scanning probe microscopes are also operated and maintained by individual research groups and by the Loker Institute. The Center for Electron Microscopy and Micro Analysis (CEMMA) allows access for researchers to scanning and transmission electron microscopes (SEMs and TEMs). 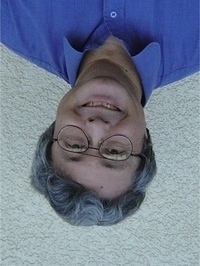 The Department maintains its own glass and electronics shops, staffed by one glassblower and two electronics technicians. Chemistry students also have access to the College Machine Shop. This is a centrally located facility which allows students and postdocs to have a team of highly skilled machinists and technicians assist them in the design and construction of equipment. In addition, the College Graduate Student Machine Shop is a shared facility that provides graduate students and postdocs direct access to basic machining equipment necessary to conduct research.